One Stop Handling Ireland is the brainchild of two industry professionals who between them have a combined experience totaling 35 years. The success of our business is based on the supply of Excellent Advice, Excellent Materials Handling Solutions and Reliable – High Quality – Safe and User Friendly Equipment. Using our knowledge of European Directives & Standards, all of our handling equipment fully complies with the European norm. All equipment is supplied fully tested & certified thus been ready to go straight to work. One Stop Handling Ireland supply standard & non-standard equipment for that special application. We can also modify and manufacture non standard equipment for that special application. Whether it is a standard piece of lifting equipment for a warehouse or factory environment or a bespoke project, our team has the expertise and extensive experience and knowledge to provide the best solution. All our products are sourced from manufacturers who are leaders in their fields, this enable us to offer you the customer the best possible product / solution. 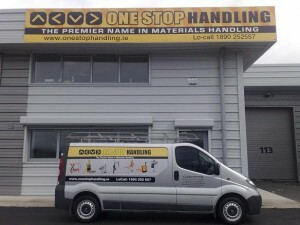 One Stop Handling Ireland supply Materials Handling Solutions & Lifting Equipment to industries as wide ranging and diverse as Electronic, Computer, Packaging, Woodworking, Metal, Food, Drinks, Pharmaceutical. Literally all industries, we can also modify and manufacture non-standard equipment for that special application. All our projects are based on close dialog and cooperation with the customer. We analyse and clarify your needs so we together find the most suitable solution. Our experienced team is always ready to give you the best guidance. All our products are designed and tested in line with the latest EC Directives and Proposals and will be issued with an EC Declaration of Conformity. The standard guaranteed is for a period of 1 year from date of delivery or installation, extended guarantees are available. One Stop Handling Ireland includes operator training with all Material Handling Systems. One Stop Handling Ireland offer a full on site service package with either regular planned preventative maintenance or a full maintenance contract. Full audit trail for any service work carried out. Scheduled visits to tie in with any operational requirements. Manufacturers genuine parts used to ensure safe & reliable operation of the equipment at all times. Ensure warranty requirements are fulfilled.